CBD oil topicals and tinctures at Northern Liberties' new Anthology Wellness shop. First came the CBD oil-infused ice cream from Little Baby's. Soon after, the CBD oil smoothies at Fuel. 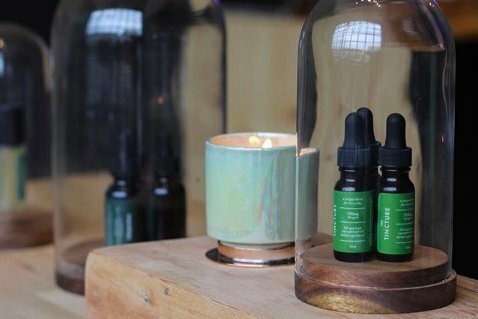 Now the CBD oil market in Philadelphia is expanding even more with the opening of Anthology Wellness in Northern Liberties. The shop at 835 N. 2nd St. debuted last weekend to offer two lines of CBD extract products, including lotion, salves, and other personal and bath products. The inventory is a mix of signature Anthology Wellness products and items made by Adaptation. According to Philly Mag, the idea for Anthology Wellness was inspired by owner Mike Beck's mother, who used a CBD tincture while battling lupus and fibromyalgia. Cannabidiol is a non-psychoactive cannabis compound (you won't feel "stoned") with significant medical benefits. It is said to relieve pain, apparently interacting with receptors in the brain and immune system to reduce inflammation. The retail shop, the first of its kind in Philadelphia, creates its products through a partnership with two Oregon-based CBD producers. There is no recommended dosage of CBD oil regulated by the FDA yet, which has only approved cannabidiol for two types of epilepsy. In turn, the shop has a lot of freedom in creating items blending the hemp-based extract. The location shares a storefront with Exit Skate Shop.